Benton Middle School art teacher Jennifer Hodge has been recognized as Norwalk-La Mirada Unified’s 2016-17 Teacher of the Year for inspiring her students to adopt a lifelong appreciation of the arts and apply their creative, critical thinking skills in other subject areas. Hodge started as a substitute teacher at Gardenhill Elementary School 16 years ago and transitioned into Benton’s visual and performing arts magnet as an art teacher in 2010. She immediately noticed Norwalk-La Mirada Unified’s high value on teacher input and collaboration, and various professional development opportunities. Hodge also takes part in the annual Caring Beyond the Classroom event, when teachers provide school supplies to students at the beginning of each year. 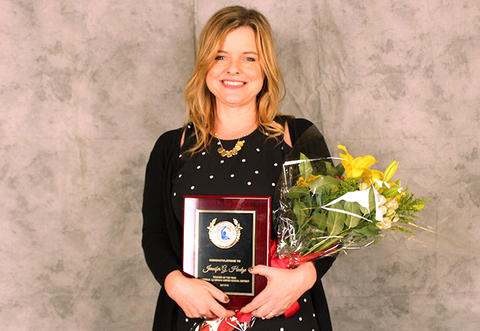 060817_NLMUSD_HODGETOTY: Benton Middle School art teacher Jennifer Hodge has been recognized as Norwalk-La Mirada Unified’s 2016-17 Teacher of the Year. Benton Middle School art teacher Jennifer Hodge has been recognized as Norwalk-La Mirada Unified’s 2016-17 Teacher of the Year.